I’ve been trying to figure out what I love using the Instant Pot for the most. So far I love cooking meals that normally take all day to cook in my oven or slow cooker. 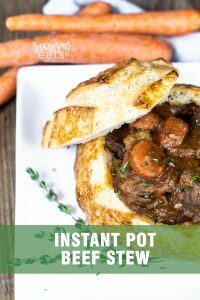 There are so many times when I forget to thaw my slow cooker meals or forget to start them in the morning and with the Instant Pot, I can now cook those up within an hour of starting it! Beef stew is one of my favorite comfort foods. It warms every chill in my body and makes me feel super cozy! You don’t need an Instant pot to follow this recipe, I will include instructions for cooking on your stove top. Brown your Beef! Making sure to get a good sear on your beef helps develop the flavor of your beef & create the flavor for your stew sauce/ broth. When you deglaze your pot with red wine it helps lift those brown bits and deepen the flavor of your sauce. You can use broth for this if you’d like, but red wine gives a better depth to the flavor, the alcohol will cook out. Use a cast iron/ dutch oven pot to cook, so you can sear in the same pot and have a lid. It also heats more evenly. After adding the beef and potatoes back in, cover and cook on low until tender (1.5-2hrs), stirring occasionally. OR Cover and put in a 275-degree oven and cook for 2-3 hrs (or until tender). 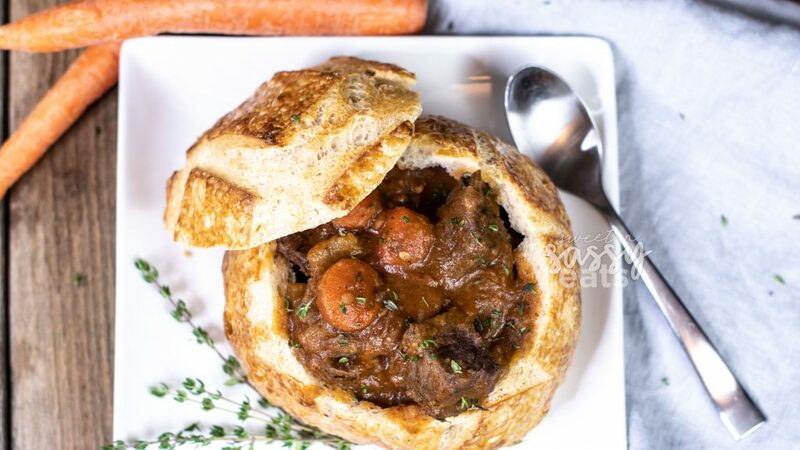 This beef stew is the epitome of comfort food for those cold fall and winter days. 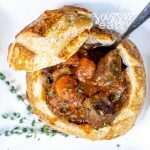 Typically a stew like this takes all day to tenderize the beef and meld the flavors together, but with an Instant Pot, you can now have this soul-warming stew in an hour or less! Turn instant pot on to Saute mode, melt butter in the pot. Add 1/2 the meat (do not crowd pot) and sear all sides of beef, remove & set to the side. Sear the remaining half of the beef, remove & set to the side. Add Onions, Carrots & Celery. Saute 3 min. Add Red Wine and deglaze the pan by scraping the bottom with wooden spoon. Add garlic and saute another couple of minutes. Then add the tomato paste & stir. Add the Beef Broth and turn the Instant pot off. Make sure to scrap the bottom of the pot and get all stuck on particles. Add the beef stew meat back in and add the red potatoes. Stir. Put Instant Pot lid on and seal. Set for HIGH Pressure and for 35 minutes. When cooking is complete, do a manual release on the pressure and turn to low Saute mode. Add 2 drops of Thyme and 2 drops of Oregano Vitality Essential Oils. Stir. Mix cornstarch with a couple tablespoons of the beef stew liquid. Add to pot and stir well. Allow stew to thicken. 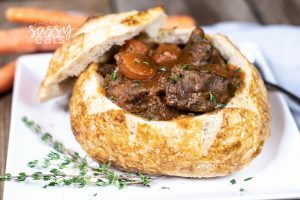 Serve in a bowl or my favorite a sourdough bread bowl.